Style and stability for many years to come This patio cover is designed as a Do-It-Yourself assembly system. An easy, no roof climbing, 2 person assembly with a Click-N-Lock system makes the entire process safe and simple. The patio cover is maintenance free and is a great way to save time and effort, to create a quality outdoor experience for many years to come. Palram’s Feria patio covers are built from durable and rigid powder coated aluminum structure glazed with virtually unbreakable SUNPAL® multiwall polycarbonate system. With snow load capability of 150kg/m2 or 35lbs/ft2 with additional 50% of safety margin high impact hail resistant panels and wind load of up to 120 km/h or 75mph, you can be rest assured that spending time outside with family and friends on rainy days is not an issue anymore. 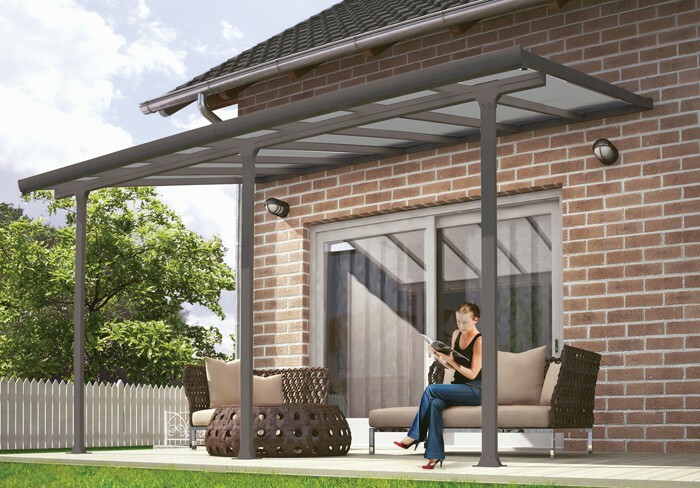 The optional crystal clear side wall provides protection from wind and wind In addition, the SUNPAL® glazing system filters harmful UV rays from entering the patio cover space means that lounging outside on a sunny day is both enjoyable and safe for your family, but will also protect your garden furniture, BBQ and other belongings all year round. Unlike different models of patio covers, the Feria is designed as a simple do it yourself project so there are no extra installation or custom fitting charges. With the easy to follow assembly instructions, the complete supplies kit and with the innovative SUNPAL® “click and lock” glazing system roof climbing is not needed. The Feria also includes durable ground anchoring kit with accessories needed. Conventional patio covers are using standard glazing panels that are fixed to the structure rods side by side. The gap between the glazing panels is a weakness point for water to drip inside the patio cover. Palram’s “click and lock” system locks the glazing between the structure rods and prevents water from penetrating the glazing. The built in guttering system collects the water on both sides of the pergola, gutter drain pipes can be attached in order to collect rain water for gardening and ponds.